It is still widely believed that Western Europe during the Early Middle Ages, around AD 500-1000, was an intellectual wasteland, a dark age in which the vast majority of the people were illiterate and ignorant. During this dark age the learning of the ancient Greeks and Romans was completely forgotten by the barbarians who overthrew the Roman Empire, and what learning did survive was ruthlessly suppressed by a Catholic Church which worshiped ignorance and superstition. I have attempted to correct these misconceptions in previous posts by writing a little about what historians of the period have to say. You may be surprised to learn that one of the greatest advances in transmitting the written word from the invention of the printing press all the way back to the invention of writing itself occurred during the so-called Dark Ages. This would be the development of the script called Carolingian minuscule. What is Carolingian Minuscule? In a sense, it is what you are looking at now. That is to say, our modern system of upper-case and lower case letters along with punctuation like periods and commas are derived from Carolingian Minuscule. The alphabet we use in English comes from the Latin alphabet which the Romans used. They adapted their alphabet from a version of the Greek alphabet, which the Greeks had adapted from the alphabet invented by the Phoenicians. All of these ancient alphabets had only what we call upper-case or capital letters and no punctuation. This is a little hard to read. Around the first century AD scribes began to experiment with various forms of cursive writing. Some of the Latin letters, when written quickly with a pen, began to resemble the letters we know as lower case letters. These scribes also developed simple systems of punctuation to indicate pauses when reading aloud. There was no difference in meaning between upper case and lower case letters. The differences in the shapes of the letters were simply the result of the handwriting of the individual writer. There was no consistent use of punctuation. As Christianity grew in numbers and influence, there was more interest in creating some sort of system of punctuation to help the reader when reading the Bible or other religious texts aloud during services. There was also a great need for more texts to be copied and any way of increasing the speed of making copies was appreciated. After the fall of the Roman Empire in the West, the experimentation in developing various scripts continued in the monasteries, particularly in Ireland and England. The native Celtic languages of the Irish monks were quite unlike Latin and they felt the need to make the Latin texts they studied and copied easier to read. This, these monks introduced the idea of putting spaces between words. They also started to use different marks to indicate differing lengths of pauses, something like our periods, commas, semicolons, etc. On the continent, the monks and scribes of the Merovingian Franks also used a wide variety of scripts. Because these scripts varied from region to region and even from monastery to monastery and still didn’t have any consistent system of using upper and lower case letters or punctuation, writing in Western Europe was still a mess. These various scripts were not as clear and legible as they might have been and reading and making copies was still something of a chore. Charlemagne, or Charles the Great, was the king of the Franks from 768 to 814 and the first Holy Roman Emperor from 800-814. 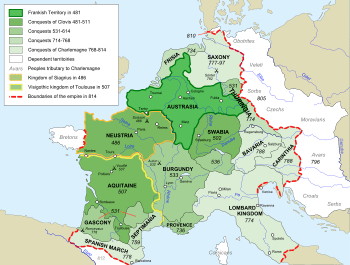 His father Peppin had deposed the last of the Merovingian kings of the Franks and Charlemagne had united the Franks and conquered most of Western Europe, including what is now France, Germany, northern Italy, and a part of Spain. Charlemagne was no mere warlord, though he was fond of fighting. He was aware that education and culture had degenerated badly in his Frankish realm since the fall of the Roman Empire and he was determined to do something about it. He reformed the administration of his empire and put it on a more professional level than it had been for centuries. He introduced new coinage with improved trade and stabilized the empire’s finances. He was a pious Christian and tried to reform the Frankish clergy. Although Charlemagne himself was illiterate, he knew the importance of literacy for administration and established schools to educate the young. He himself attempted to learn to read and write. He had some success with reading but he started too late in life and was never able to learn to write. Since there were few teachers available among the Franks, Charlemagne sent abroad for teachers, particularly from the British Isles. The chief of these teachers was a monk from York named Alcuin. York had become a center of learning in England and Charlemagne was eager to hire Alcuin to improve the palace school which had been used to train royal princes for rule. Alcuin introduced a liberal arts and religious curriculum at the palace school and gathered scholars at Charlemagne’s capital of Aachen in the hopes of establishing another center of scholarship in Francia. He also helped to create the new, clearer, more legible script that came to be known as the Carolingian minuscule. This new script included letters with uniform rounded shapes to make reading and copying easier along with clear distinctions between capital and lower case letters, spaces between words and sentences and a standardized system of punctuation. As a result manuscripts produced in any part of western Europe could be read by a scholar in any other part of Europe. Because the letters were smaller, yet more legible, more words could be fitted on a page, thus conserving valuable parchment or vellum. Under Charlemagne and Alcuin’s guidance, scribes made new copies of every Latin manuscript they could find with the result that if a manuscript or book written in Latin managed to survive into Carolingian times, there is a very good chance that a copy made during that time survives today. In other words, if it were not for the reforms in writing that took place in the middle of the Dark Ages, most of the literature from the Roman Empire would have been completely lost. Carolingian minuscule was adopted throughout Charlemagne’s empire and its influence survived even after his empire fell apart during the reigns of his grandsons. Over time this script developed into the Blackletter script which was used in Germany until the twentieth century. 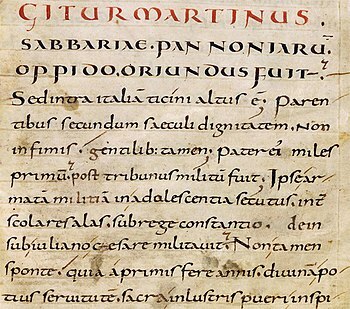 Italian humanists came to believe that this script was barbaric and “Gothic” and looked back to the original Carolingian minuscule as the way that properly civilized Romans wrote, believing that the Carolingian manuscripts were original Roman texts. The humanists went on to develop new scripts based on the Carolingian minuscule and when printing was invented, printers used these scripts as models for their typefaces. So, if you can read this, be sure to thank Charlemagne and the medieval scholars who invented our modern letters and punctuation.